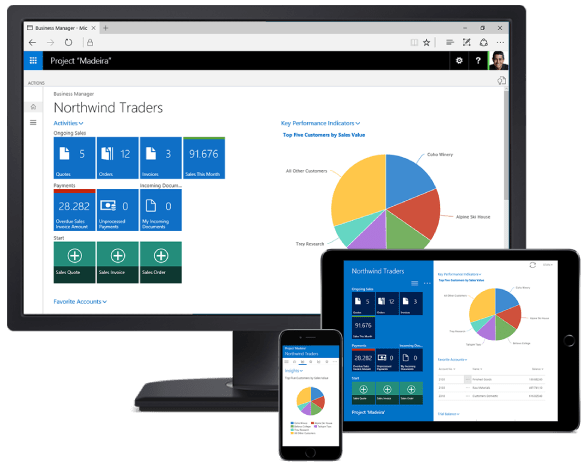 As of April 2 2018, Microsoft is launching a new object range request process for Microsoft Dynamics NAV and Microsoft Dynamics 365 Business Central. should submit a completed Microsoft Dynamics Object Range Request Form to their Regional Operations Center for processing. 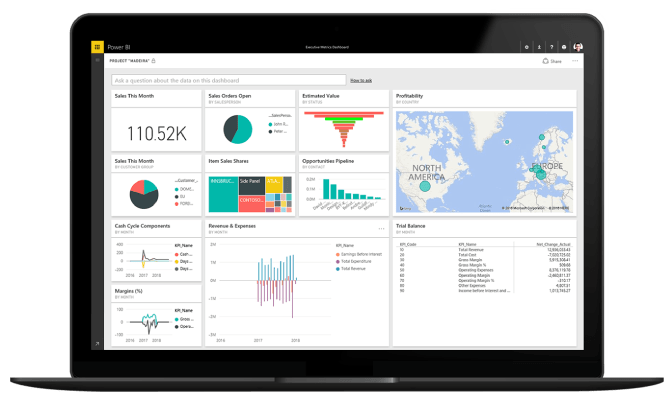 Partners who intend to develop their solution for both products can choose to develop their solution using the same object range for both products or have a separate range for Microsoft Dynamics NAV and Microsoft Dynamics 365 Business Central. Partners who only intend to develop their solution for Microsoft Dynamics 365 Business Central need only to complete Phase 1 of the Microsoft Dynamics Object Range Request Form. Partners who intend to develop their solution for Dynamics NAV should also complete Phase 3 of the Microsoft Dynamics Object Range Request Form. Integrated GST (IGST) – which will be levied by Central Government on inter-State supply of goods and services. For Intra State Transactions: In case of Intra State transactions, Seller collects both CGST & SGST from the buyer and CGST needs to be deposited with Central Govt. and SGST with State Govt. 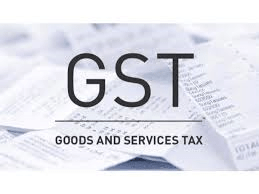 For Inter State Transactions: Integrated Goods and Service Tax (IGST) shall be levied on Inter State transactions of goods and services which are based on destination principle. Tax gets transferred to Importing state. More over it is proposed to levy an additional tax on supply of goods, not exceeding one percent, in the course of inter-state trade or commerce, to be collected by the Central Govt. for a period of two years, and assign to the States where the supply originates. Valuation of stock transfers to be determined. Exports and Supplies to SEZ units will be zero rated. What impact GST will have on pricing of products as compared to current scenario? Let us take an EXAMPLE to understand this clearly. In the above example, you can note that the tax paid on sale within state can be claim against tax paid on sale outside state in GST system, which is not in present tax system. The credit of CGST cannot be taken against SGST and credit of SGST cannot be taken against CGST but both credits can be taken against IGST. Here, every tax payer will be issued a 15 digit common identification number which will be called as “Goods & Service Tax Identification Number” (GSTIN) a PAN based number. Online application form for dealers will be available to provide their details and upload documents. Registration includes basic steps like register themselves on the Enrolment page, and then Login using the given “User ID” and “password”, filling the application form by uploading the requisite documents related to excise, Service Tax, IEC, CIN, Professional Tax number, Shops & Establishment Number and any other state specific registration numbers, contact numbers, postal address & E-mail address of business entity, bank account details including MICR code, place of business, details of goods & services, scanned signed photographs. Like, every coin has two sides, even this concept of GST has its own positives and negatives, we leave on the reader to decide for them the impact of GST whether on micro or macro level. The main reason to implement GST is to abolish the cascading effect on tax. A product on which excise duty is paid can also be liable for VAT. Suppose a product A is manufactured in a factory. As soon as it releases from factory, excise duty has to be paid to central government. 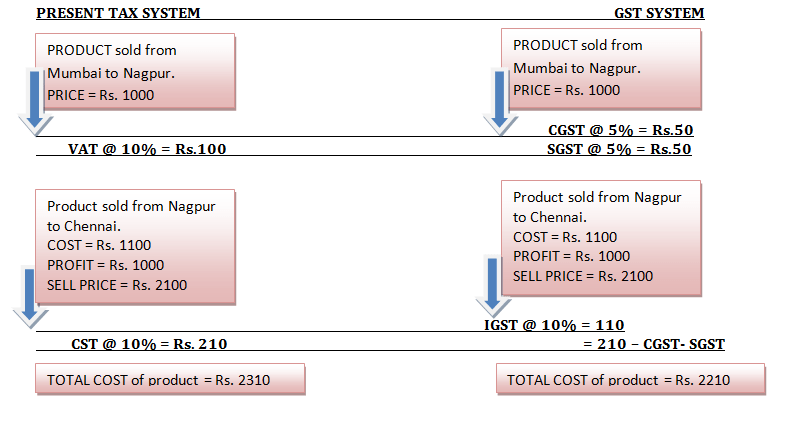 When that product A is sold in same state then VAT has to be paid to state government. Also no credit on excise duty paid can be taken against output VAT. This is termed as cascading effect since double tax is levied on same product. The GST is being introduced to create a common market across states, not only to avoid enfeebled effect of indirect tax but also to improve tax compliance. GST will lead a more transparent and neutral manner to raise revenue. Price reduction as credit of input tax is available against output tax. Simplified and cost saving system as procedural cost reduces due to uniform accounting for all types of taxes. Only three accounts; CGST, SGST, IGST have to be maintained. GST is structured to simplify the current indirect system. It is a long term strategy leading to a higher output, more employment opportunities, and economic boom. GST is beneficial for both economy and corporations. The reduced tax burden on companies will reduce production cost making exporters more competitive. GST is being referred as a single taxation system but in reality it is a dual tax in which state and centre both collects separate tax on a single transaction of sale and service. At present the main Indirect tax system of central Government is central excise. All the goods and commodities are not covered by the central excise and further there is an exemption limit of Rs. 1.50 Crores in the central excise and further traders are not liable to pay central excise. The central excise is payable up to the stage of Manufacturing but now GST is payable up to the stage of sale. Majority of dealers are not covered with the central excise but are only paying VAT in the state. Now all the Vat dealers will be required to pay “Central Goods and service tax”. The calculation of RNR (Revenue Neutral Rate) is very difficult and further Govt. wants to enhance its revenue hence rate of Tax will be a problem. As per the News reports the proposed rate for State GST is 12% and Central GST is 14% Plus Govt. wants to impose 1% CST at the initial stage of GST on the interstate sale of Goods and services. So the normal rate of overall tax will be 26%. This rate is very high comparing to the fact that small and medium Industries are at present not covered by the central excise and most of the Goods such as agricultural products are out of the preview of the Central Excise. Improvement in the Manufacturing and distribution of Goods and service, increase in exports, various reforms, check on corruption, less Government control are some of the factors which are responsible for the economic growth of the country. A tax system can make a revolution in the economy of the country is “rarest of the rare” thing.